ComponentSoft.net - the scammer changed his brand. Again! It looks like the con-artists behind Safabyte, ComponentForge decided that putting a new API on top of code stolen from Rebex (did than last time with XtraComponents) was not such a great idea after all. Instead, they decided to start over again with a new brand. In February, they launched a new website at CodeUltimate.com, but less than two months later, they finally settled on calling themselves ComponentSoft.net. They even got a brand-new website design this time. But the very stealthiness and secrecy they engage in is what revealed them again. Their domain name was registered anonymously. This alone made them suspicious. Why would a reputable company do this? Unsurprisingly, he changed this to a fake name after reading this blogpost. Luckily, you can still check out componentsoft.net domain history in DomainTools - the entries in red were "privacy protected" (anonymous) registrations. API of many of their components look just like Rebex API with renamed classes. Some parts were added, changed or removed, but the core functionality is the same. There are even some identical bugs! They never reveal their real company name and address. When pressed through their transaction provider, they implicitly confirmed that they are not a US-registered company, yet fail to mention this on their website. Instead, they still present themselves as "ComponentSoft, a division of ATP, Inc., located in Walnut, California" while in fact they appear to be a division of "ATP Technology, JSC located in Hanoi, Vietnam". Once again, they claim that "ATP, Inc. is a Microsoft Certified Partner", which is very unlikely because this "ATP, Inc." doesn't even seem to exist. Their install package contains two sets of DLLs. One set infringes on Rebex IP, other set infringes on other people's IP. The installer decides which one to install. This doesn't look like something a reputable company would do, ever. He will undoubtedly get rid of the fake DLLs now, but his customers victims who have downloaded the package prior to publishing this blogpost can still verify this (contact us for details). Many of their forum posts are from 2009. This is very suspicious, because the domain name was only registered in March (and the previous domain in January). In fact, these forum posts were simply recycled from the forums of their previous incarnations - unsurprisingly, they treat their customers' support request and nicknames just like other people's code. Their ComponentSoft News also extend back to 2009. No mention of any name change. But we understand - changing their name is no longer a news for them. The testimonials at their website never mention anyone who could be contacted to verify them. In fact, many of these testimonials look copy&pasted from other companies' websites. The scammer will undoubtedly modify the stolen version of SshSession.SendPacket as soon as he becomes aware of this post, but it doesn't really matter. 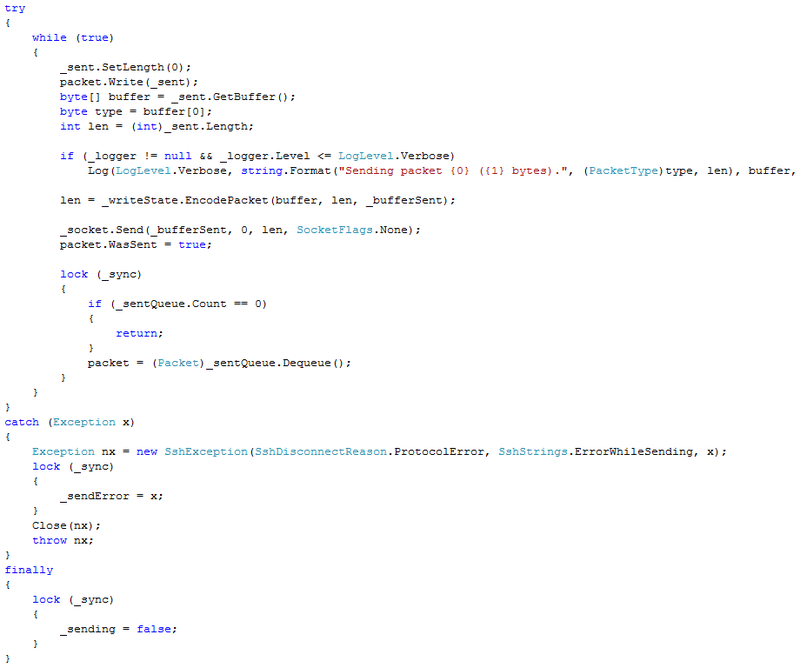 Most of the code in a majority of his components comes from Rebex, so we can simply find another example. Just let us know if you need additional information to do your own analysis. 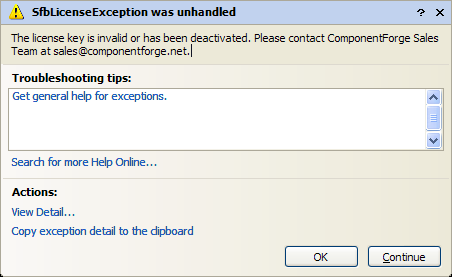 This exception is raised from a background thread that is started when the FtpClient object's constructor is called. NetXtreme component is trying to validate a license key at runtime by calling a webservice located at ComponentForge or SafaByte websites. The address of this webservice is http://www.componentforge.net/license.aspx?val=key or http://www.safabyte.com/license.aspx?val=key, where "key" is the "license key" you get when you purchase a "license" to these stolen components. The webservice returns a single byte: 1 if the key is valid and 0 if it isn't. This test is not done every time and it only occurs on 3rd, 6th, 9th, 12th, ... day of every month. On December 3rd, 2009, some versions of NetXtreme FTP Suite stopped working when both ComponentForge and SafaByte websites were down temporarily. This behavior was only observed in the purchased copies of the components. It is quite amusing that a Vietnamese software pirate is so concerned about other people pirating his software that he has chosen to offer this crippled version as the "full version" of his product. Even well-known companies have been criticized for including kill switches in their products. Because ComponentForge/Safabyte/XtraComponents “company” is actually a scam, this is yet another reason to stop using their products immediately. Essentially, all their clients are at the mercy of a software pirate. It is always worrying when a component connects to a webservice at the vendor’s website, and even more so if it was made by a fraudulent entity. For example, it would be extremely easy to "enhance" this to steal their client's passwords as well. Although this doesn't seem to be the case at the moment, the infrastructure is there. Also, calling a webservice at the vendor's website means that he knows IP addresses of all his clients, which in itself can be a security thread. Considering that all Safabyte/ComponentForge/XtraComponents products mentioned in this article are illegally based on source code owned by Rebex and other vendors, all customers are advised to cease using them and to replace them with legitimate products by reputable companies, preferrably those that don't call any questinable webservices behind their back. Big thanks goes to Max, former ComponentForge/Safabyte client, for bringing this issue to our attention! Key is weak (Application uses unlicensed code. Some of their customers victims already contacted us. I guess XtraComponents have some explaining to do now. In other news, we gave XtraComponents a wonderful opportunity last year to prove that their code was not stolen from us after they accused us of lying on a reputable third-party public forum (scroll down a bit) and their blog. Needless to say, instead of taking advantage of that opportunity, they did what they always do after they run out of arguments – they just stopped responding altogether. This kind of behavior actually supports our claim, doesn't it? Even though the fake Mr. John Carban told us yesterday that he doesn't have to answer any of our questions, he later changed his mind and posted what he thinks were answers. Unfortunately, he filled the rest of his comment with his usual lies and nonsence, so we removed it. Instead, we reproduce his "answers" here. Q: Can you prove that your company (XtraComponents) exists? We tried searching http://apps.sos.ky.gov/business/obdb/%28S%28pij3yiyqrrdsqr455rxjzda4%29%29/default.aspx but found no trace of it. Please explain. A:. Our first XCs company is not in the US. We have an Offshore Business Office in the US. Comment: He has not really proven anything, did he? He doesn't even have any real company info on his website. Q: Can you prove that you are in fact a Microsoft Certified Partner, as you claim on your website? A: It's our designers' mistakes. We are on the way to get these certificates. Comment: Oh! So it was just an accident? Perhaps the fact that he stole our code is his developer's mistake then? Q: The founders and owners of your company are nowhere to be found. Why? A linkedin.com profile would be nice. At least one that is older that a month. Q: You claim to have a lot of corporate customers already. Can you prove that any of the companies featured at your website actually uses your software? A: I can ask you the same question. Will you share your customer information with your competitor? It extremely violates our policy. Does itextremely violates your policy as well? I still don't understand why we waste so much time with this guy thief. Perhaps because he is rather amusing? Xtra: Not all CEOs have posted somethings on linkin. He is in this group. Rebex: And some CEOs have choosen to steal other people's work and remain anonymous. He is also in this group. Xtra: Check out our testimonials page. You can freely contact them. Rebex: The people on his testimonials page seem to be pulled out of his finger. Why doesn't he just name one that exists to make it possible for his customers to contact him? We don't see any reason to comment on the rest of his post. Empty threats like "If you delete this comment, 100% you are afraid of the truth." won't get him anywhere this time. There is no reason to preserve his further comments or prove anything any longer. He has already proven himself to be a questionable company by his "answers" to our question above. He would simply use any proof we publish to "fix" his code and claim everything is alright. But we can prove this to anyone else who is interested - just contact us! Can you prove that your company (XtraComponents) exists? We tried searching http://apps.sos.ky.gov/business/obdb/%28S%28pij3yiyqrrdsqr455rxjzda4%29%29/default.aspx but found no trace of it. Please explain. Can you prove that you are in fact a Microsoft Certified Partner, as you claim on your website? The founders and owners of your company are nowhere to be found. Why? A linkedin.com profile would be nice. At least one that is older that a month. You claim to have a lot of corporate customers already. Can you prove that any of the companies featured at your website actually uses your software? These questions would be trivial to answer for any legitimate company. But not for John Carban, the con artist's latest fake identity. Not surprisingly, he refused to answer any of them. It looks like he still has not fully grasped the concept of Google Cache. Although the archived copy of his website will eventually expire, it is VERY convincing in the near term because it makes it absolutely clear that he just tried to "clean up" some of the evidence against him. 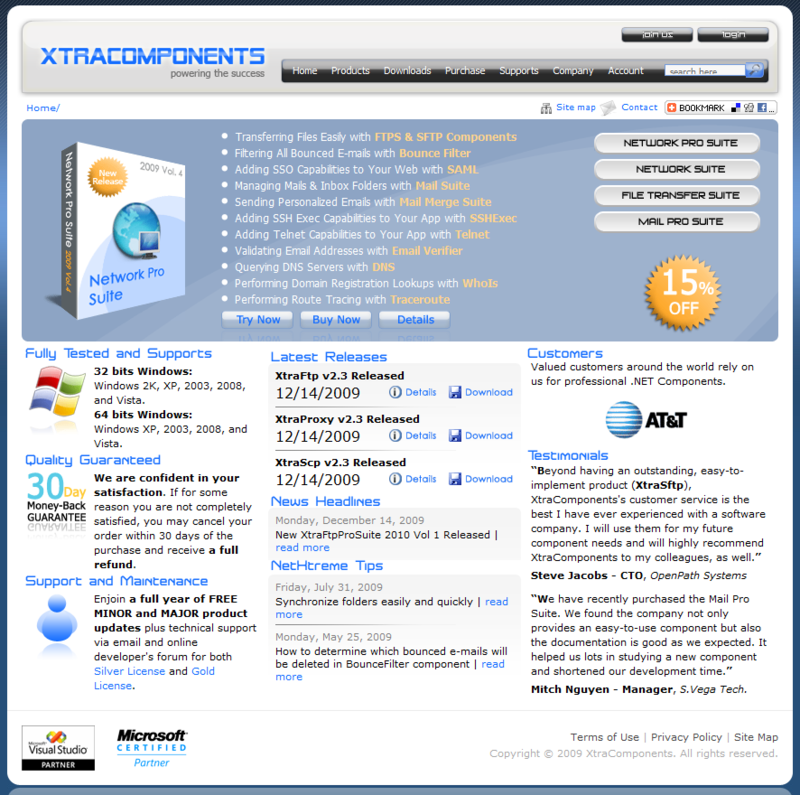 We just found out that ComponentForge simple change their name to XtraComponents(.com) and are back online doing their dirty business. You might have noticed that their previous fraudulent websites - componentforge.com, safabyte.com and xtremeui.com - are no longer in a very good shape. In fact, they have been mostly non-functional for several weeks now. Are they running out of the money the stole already? They registered their new domain name only six days ago and now they are offering stolen copies of Rebex FTP/SSL and Rebex SFTP for sale again. Interestingly, they don't have any other components in their portfolio yet. Why? 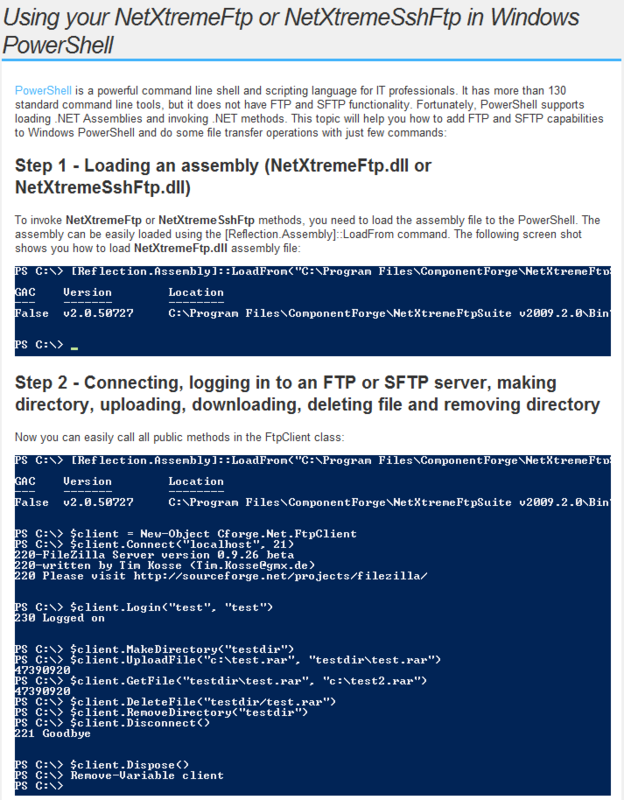 Perhaps because it takes a lot of time to rename all the namespaces and classes – yes, they dropped their previous NetXtreme brand and call their offerings "Xtra FTP Pro Suite", "Xtra SFTP (SSH Secure FTP)", "Xtra FTP", "Xtra SCP" and "Xtra Proxy" now. Their new fake identity is John Carban. They even moved their virtual office from Nebraska to Kentucky! I am sure thay will be pretty disappointed tomorrow when they realize we already found out because it looks like lot of work and effort went into their latest name change. But they still didn't have enough time to redesign their website - if you were ComponentForge's or Safabyte's customer, I'm sure you will still recognize it. · Almost identical sample code. · Check screenshots for details (blog.componentforge.net will most likely disappear soon). Have you already seen the evidence of the Safabyte scam? That was just the beginning. We have much more to show you! ComponentForge’s (aka Safabyte) company blog has some very interesting posts. It looks very familiar to me. Especially the posts which were written by a Rebex employee and published on blog.rebex.net. Safabyte just shortened, reworded and republished them on their website. Modify the script via the "Desing script" in "Properties dialog". The Visual Studio for Applications IDE pops up. Add reference to the dlls in the Project Explorer window. The SFTP and FTP/SSL components should be listed in the Add Reference dialog now. Add the code to connect, transfer files or do whatever you want as described in SFTP and FTP/SSL tutorials. Adding the references for the SSIS Script Component (used in data flow task) is similar. 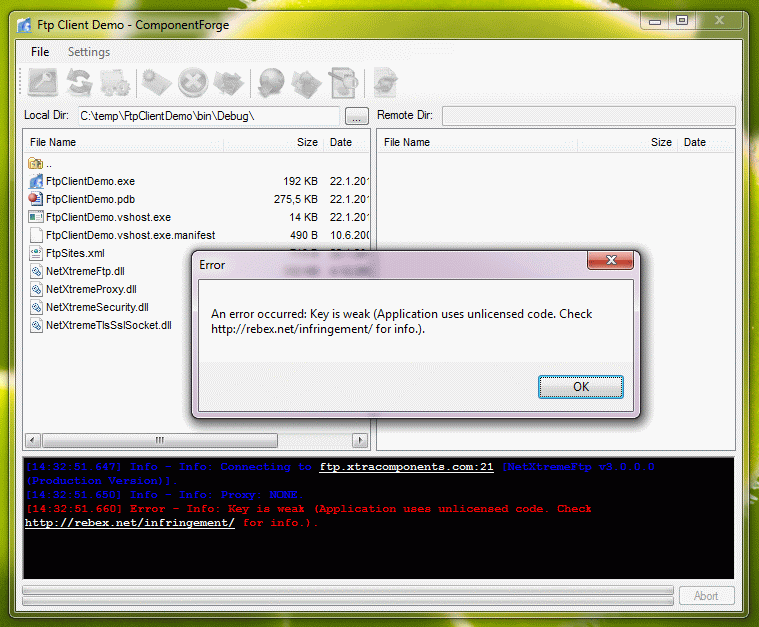 o Modify the script via the "Design Script" in "Properties dialog". The Visual Studio for Applications IDE pops up. o Add reference to the dlls in the Project Explorer window. The SFTP and FTP/SSL components should be listed in the Add Reference dialog now. o Add the code to connect, transfer files or do whatever you want as described in SFTP and FTP/SSL tutorials. o Adding the references for the SSIS Script Component (used in data flow task) is similar. · Amusingly, they forgot to change the component name. 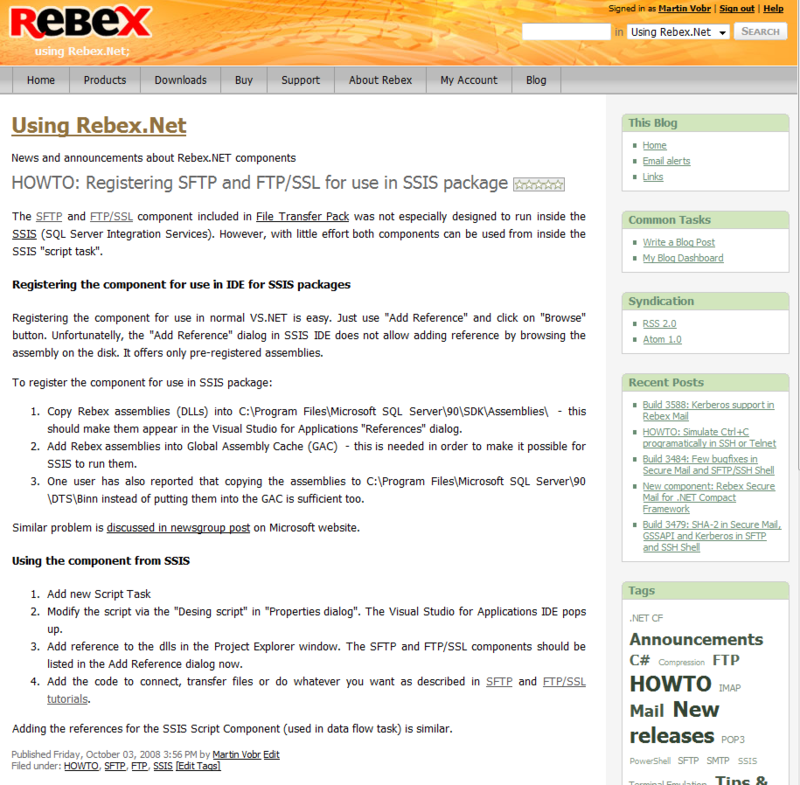 FTP/SSL is the name of a Rebex product, ComponentForge actually calls their forged versions NetXtreme FTP and NetXtreme SSH FTP (instead of SFTP). · Screenshots are attached – blog.componentforge.net will most likely disappear soon. ComponentForge website is still down, but their blog and FTP is alive and well! As of today, ComponentForge.net just shows a "Loading..." message and none of their downloads is working. Interestingly, their blog is still up and running. Their FTP server (hostname is ftp.componentforge.net and username/password is test) is still active as well and some of the files there were uploaded yesterday.